In an ideal world, everyone would be able to maintain a strong and healthy set of natural teeth for the entirety of their lives. Unfortunately, while tooth loss in adults continues to decrease over time, there are still many patients who struggle with long-term gaps in their smile. Here in Leawood, we strongly recommend replacing natural teeth as soon as possible to avoid further oral health risks such as the development of periodontal disease and occlusal strain, and Dr. Ayer has several high-quality options waiting in the wings. To schedule a complimentary consultation, contact us today. Why Choose Dr. Dennis Ayer for Replacing Missing Teeth? 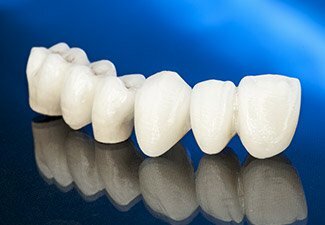 Dental bridges are sturdy, custom prosthetics that are designed to fit within gaps along the dental arch left by missing teeth. If teeth that once appeared consecutively have been lost, Dr. Ayers may recommend this replacement option. It is held in place with the anchored support of two traditional dental crowns or dental implants. In most cases, our team recommends dental implants because of their oral health benefits and increased longevity. Removable prosthetics (dentures) have been the go-to method for replacing lost teeth for hundreds of years, and today, many patients still appreciate their affordability and convenience. If you determine that dentures are the best treatment option for your situation, Dr. Ayer will be happy to design a lifelike, customized appliance that beautifully replenishes your smile. 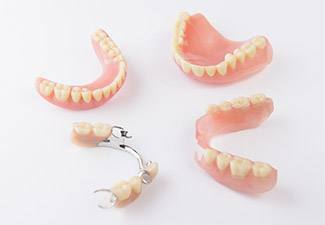 Both full and partial dentures are available from our office, depending on your needs. Implant-retained prosthetics are also an option for patients looking for more permanence and security for their smile! While every patient’s reconstructive needs and goals are different, Dr. Ayer is highly likely to recommend dental implants as the premier solution for replenishing lost teeth. Why? 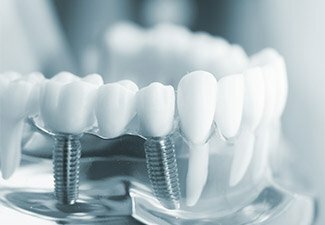 Because unlike more traditional services, implants start by rebuilding the tooth’s natural root and establishing a strong foundation for the new dental structure while also preserving the healthy jawbone. Once a customized restoration is placed atop the implant(s), the final result is virtually seamless from what came before in look, feel, and function. Better yet, they’re designed to last for decades at a time.